It’s back! Now in its third year, RTE Radio 1’s Comedy Showhouse is a festival of Irish comedy featuring the best writers, performers and acts live one stage in Project Arts Centre. Join us in the Space Upstairs for 6 days packed full of live comedy which will be broadcast on RTÉ Radio 1 across 2018. An all-female comedy about waiting! 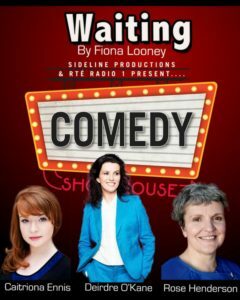 Last year WAITING proved such a success that it is now being supersized as a 6-part series recorded over 3 nights starring award-winning actresses Deirdre O’Kane, Caitriona Ennis & Rose Henderson. 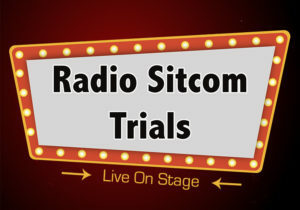 See a new show every night with all shows recorded for future broadcast on RTE Radio 1. Starring the Cork-born author of the successful Irish Mammy books, best seller of Bolloxology and a regular performer on stage, radio and TV. 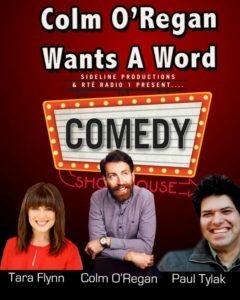 This show features two of Ireland’s best comedy actors; Tara Flynn and Paul Tylak, plus special guests, and has already won Best Irish Radio Comedy 2016 and 2017 plus the Celtic Media Award 2017 for Best Radio Comedy Programme. A live performance of the winning radio sitcoms chosen as part of a brand new initiative designed by Sideline Productions and grintage.com to promote new Irish comedy writing for radio, supported by RTE Radio 1 with The Broadcast Authority of Ireland.